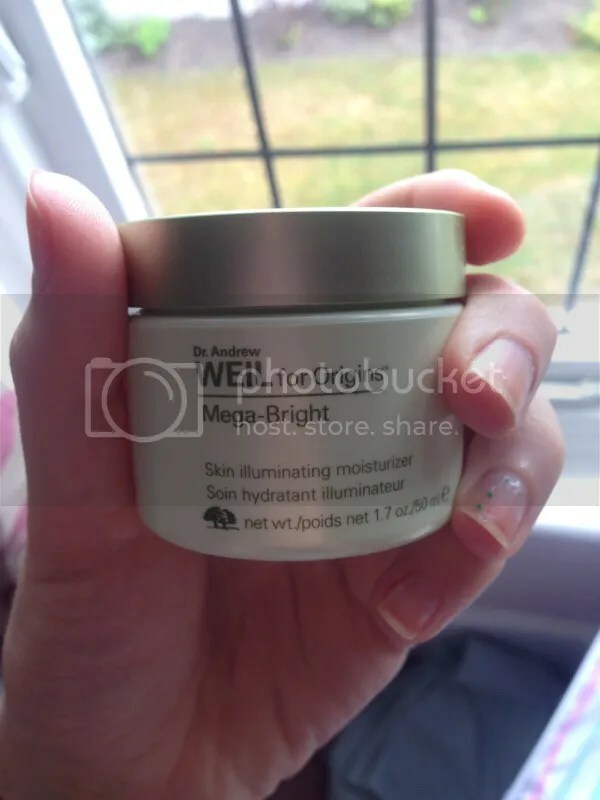 Review: Dr Andrew Weil for Origins Mega-Bright Skin Illuminating Moisturiser | Becky Alyssa's Beauty Box. Bit of a long product name, don’t you think? For now, let’s just call this ‘My New Favourite Moisturiser’. I first came across this casually browsing the Origins concession at my local Beales store to kill time whilst waiting for a bus. I’d heard really good things about Origins but everything seemed a little too expensive for me to go throwing my money aimlessly at. The sales assistant was lovely, very down-to-earth and approachable so I felt happy to talk to her all about my bad skin problems to find products that would suit me. I ended up going home with two very generous sample pots – one of the Drink Up overnight mask and one of this wonderful day moisturiser. Initially I was doubtful about trying this – anything ‘illuminating’ has a habit of turning my already shiny skin into a glowing beacon of oiliness, but I gave it a try. This moisturiser had a gorgeous soft ‘natural’ scent, something I can’t quite put my finger on, but very subtle and refreshing. It felt lovely on my skin and was a pleasure to apply from day 1 – it has a very light, translucent and slightly gelatinous texture which completely absorbs into the skin in a matter of seconds, leaving behind absolutely no trace of greasiness whatsoever. Immediately my skin felt much smoother and softer. After a few weeks of using this daily (and repurchasing the full size), my skin looks much more healthy and radiant without looking shiny or greasy at all. The best part: my redness has been significantly reduced. It seems to calm, cool and moisturise my skin so perfectly that none of my high street moisturisers ever did. I’ve even been going out wearing only some powder on my skin, or – shockingly – no makeup! Which is unheard of for me. My only slight issue? The price! Costing a slightly painful £46, this is one of Origins’ more expensive moisturisers. Although it looks like the small 50ml tub will last me a good few months at least, it’s worth picking up a sample to try it at home before purchasing the full size, or get one on Ebay from a reputable seller. I managed to get a brand new tub for £29 from Ebay, saving a nice amount on the retailer price. And since Origins is available in larger Boots stores, this is definitely one to save those points up for. Summary: This is never one I’d pick off the shelf on my own, so thank you lovely SA for recommending it! My skin looks much more balanced and radiant, and being able to get away with less makeup really says a lot about this product! No doubt I’ll be repurchasing in future. Have you tried this moisturiser? & any other favourites from Origins I need to get hold of? Let me know! Pingback: October Favourites | Becky Alyssa's Beauty Box.